So we now have summer, autumn, winter and spring colours to reflect July, October, January and April starts (sorry southern hemisphere AYWMCers - the colours are northern hemisphere based). Did you spot the meaning behind the logo? I love the bold yet simple design, and it's also a bit of a talking point. It combines the calendar aspect of AYWMC with the camera - my daughter got it straight away but my husband didn't. The brand has a new website, new book covers, and a new social media design. I couldn't be happier with the way AYWMC looks now - more professional, with a bit more gravitas, but hinting at the fact it's a fun course. I started talking to Studio Tangerine back in January. I was a bit hesitant, as I'd worked with designers before who had charged me £1,000s for an over-engineered site and bland design. But this time I have been able to spend my budget where I wanted to - on the design rather than the back end (I love Squarespace for making it easy to update with a new design). The process was incredibly straightforward, and after I'd handed my baby over to them, they gave it back in one piece, looking better than ever. AYWMC is going from strength to strength. I am so grateful to current students who recommend the course to their friends - word-of-mouth is the best way for people to find out about the course. They will know that it's not a quick-fix weekend course, and won't be disappointed when it doesn't all work like magic after the first lesson. I'm writing this at the beginning of July 2018, and already 915 people have signed up for the September start. At least half of those will have found the course through a friend. AYWMC will not change. The course works fabulously, and has brought confidence and pride to so many new photographers around the world. I am taking on 2 part-time community managers to help me make sure the larger groups continue to run smoothly, and that we don't lose the compassionate, non-competitive atmosphere that sets AYWMC apart. My most exciting news, that I've saved for the end, is that I've just got off the phone with my chosen charity (Charity Water), who have agreed we can build our own AYWMC well. More details to follow, but I'm so pleased we will be able to contribute as a community to build a well for another community that doesn't have access to clean water. 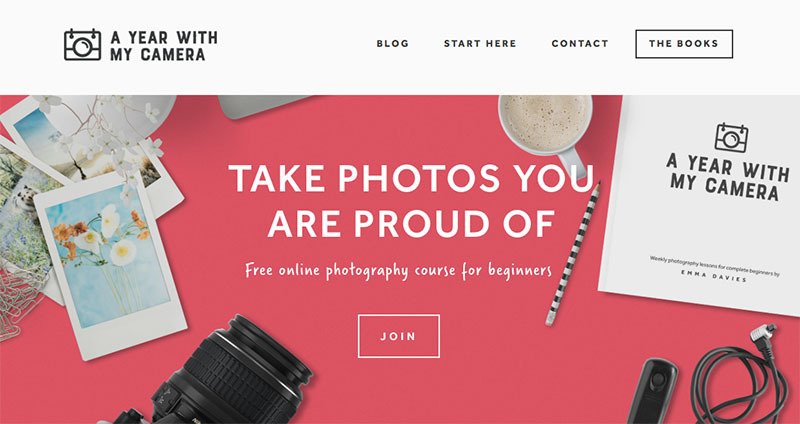 A Year With My Camera is free by email, and is for complete beginner photographers who want to learn how to use their big camera at their own pace.